Justin Rose faltered over the closing stages at the WGC-HSBC Champions for Tony Finau to take a three-shot lead into the final day. 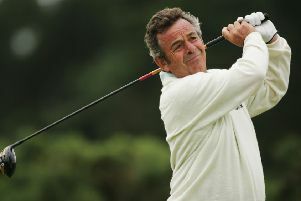 Englishman Rose turned in 33 to open up a one-shot lead at Sheshan International Golf Club in Shanghai. But Rose, who could move back to the top of the world rankings with a win, dropped three shots on the final two holes to sit three off the lead alongside American duo Patrick Reed and Xander Schauffele. Rose found the hazard at 17 and the water at 18 for Finau to end up with the same three-shot lead that he had started the day with. “I’m looking forward to tomorrow,” Finau, the American Ryder Cup player, told the European Tour’s website after closing his round of 70 with three birdies. “I’ve got a world-class field chasing after me. This is the position you want to be in and I’ll be looking to close out my first tournament in this position, which is exciting for me. “Whether it happens or not, it’s an experience that you learn from and you continue to move forward. “It was great to birdie the last three. It’s always a nice way to finish no matter what position you’re in. “I didn’t have a lot going my way for the first half of the day and Rosey was making his run. Finau boosted his hopes of a first European Tour win at just the 20th attempt with a strong finish. The big-hitting 29-year-old from Utah picked up a shots on the par four 16th and then almost made a hole-in-one on the 17th. The birdie was enough to see Finau regain the lead and his length off the tee allowed him to take advantage of the par five last. While Finau completed his big finish to get to 13 under, there was trouble lurking for others. As well as Rose’s problems, Reed found the same hazard at the 17th but got up and down to drop just a single shot. Rose surrendered a double-bogey on the 17th and then lost another shot on the last to drop to ten under. Reigning Race to Dubai champion Tommy Fleetwood is five shots off the lead alongside American Andrew Putnam. Fleetwood had been one off the lead after birdieing the third, fourth and tenth and dropping a shot on the fifth. But he triple-bogeyed the 14th after finding the water before picking a shot back up on the last. Putnam made one bogey in a 67 to sit a shot ahead of Thai Kiradech Aphibarnrat and fellow American Keegan Bradley, who both fired rounds of 70. Jason Day was at six under, a shot clear of Thorbjorn Olesen, Patrick Cantlay and Billy Horschel. Rory McIlroy’s problems continued with a 75 and the four-time Major champion is tied for 60th on eight over.